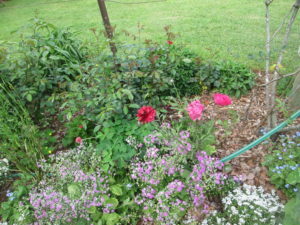 September 2015 … last years Open Gardens ….. 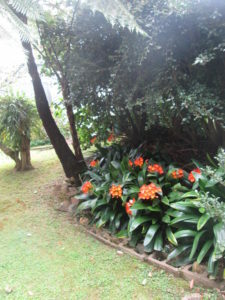 There are many beautiful gardens tucked away and not open to the public. 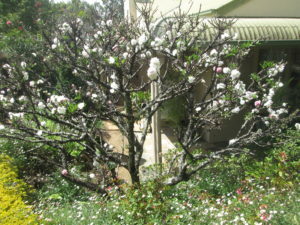 They grow on the deep brown volcanic soil and higher rainfall then we get on the lower country. 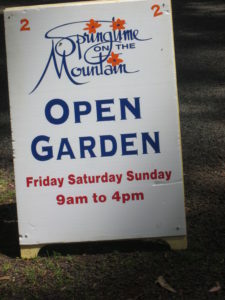 However, in September every year, there is Open Gardens Trail on a weekend: Springtime On The Mountain – Open Gardens Trail …. 2016. 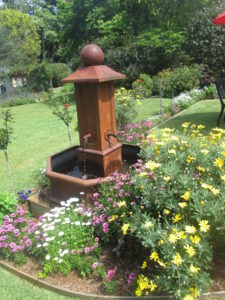 Springtime on the Mountain is the most spectacular annual display of gardening design and skills in south-east Queensland. 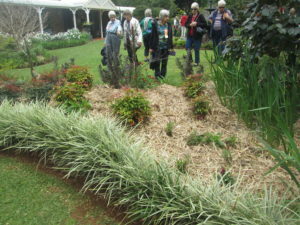 This year (2016) the Tamborine Mountain Garden Club will open seven diverse and delightful home gardens for public display – most for the first time – over a three-day weekend. Friday 25th, Saturday 26th & Sunday 27th September, 2015 — 9am – 4pm each day. There will also be entertainment, a cafe open for lunch, morning and afternoon teas, plant stalls, art displays and loads of information about gardening at the Showground. 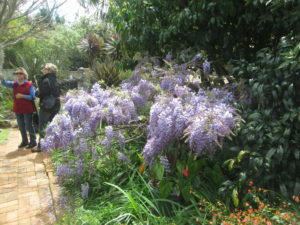 See the gardens of three houses last year in September 2015. The beauty of nature !! 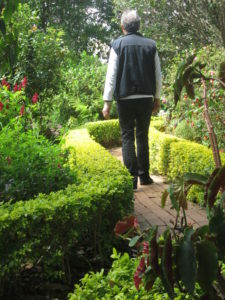 Each house with it particular garden which we looked at, is a series of interconnecting Garden Rooms. 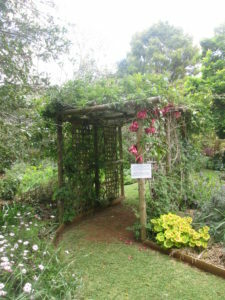 The gardens has been designed as a series of linked garden rooms. Each garden room has a different function but has creates a real sense of belonging. It may not be open space but it has sense of unity different to the next garden room. 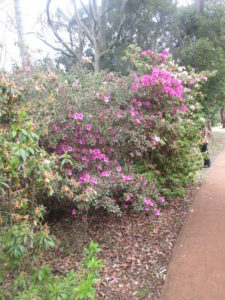 Each Garden Room is bordered by colourful beds of flowers. 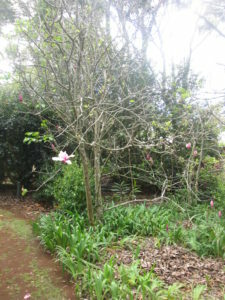 Walking from one Garden Room to the next, if you love flowers, you keep walking and walking, drawn by the unexpected possibility of what is around the next corner. 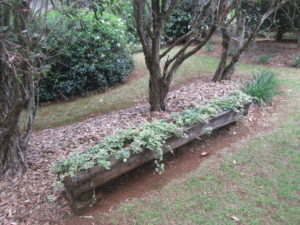 When you come upon a new flower bed, you just want to stop and enjoy the beatuty of nature. 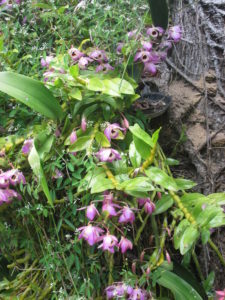 Specific plants are often not often named but the photos show the rich changing colours and the growing plants. The sign that greeted us …. much anticipation !! side of the street to the house we were going to…. 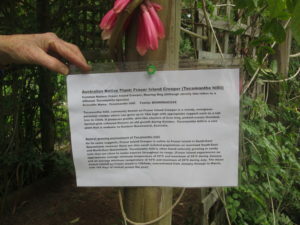 A rare Australian Native plant: …. 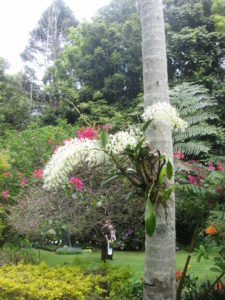 Fraser Island Creeper Tecomanthe hillii. 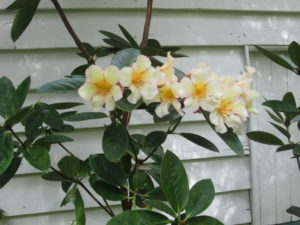 It is woody evergreen perennial climber which can grow up to10 m high with appropriate support such as tall tree could supply a tall climber. 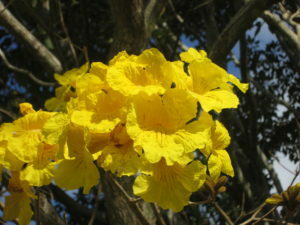 It produces a prolific skirt – like clusters of 6 cm. 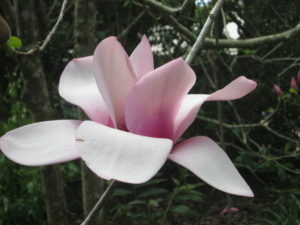 long pinkish- cream throated lipstick – pink coloured flowers on old growth during September / October. 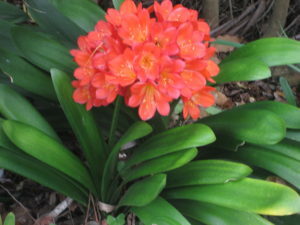 Tecomanthe hillii is a rare plant that is endemic to Eastern Queensland, Australia …… Also see this website. The contrast between the informality of the overall garden and this formal clipped box hedge, is very apparent ….. 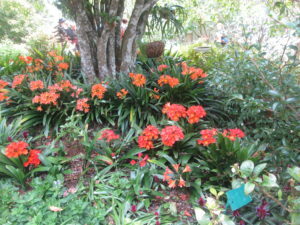 Spectacular bed of cliveas ….. they love more shaded areas …. 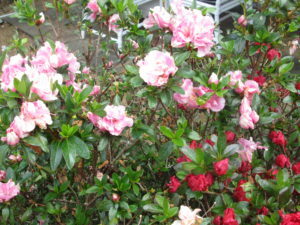 Azaleas with their rich varieties of colour, are a great pleasure to see and enjoy …. 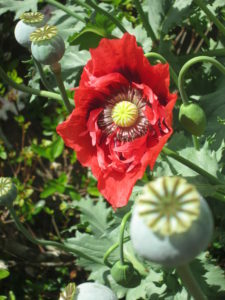 Red poppies …. the eye catching beauty …..
temperatures and moister climate on the mountain …. high tree. 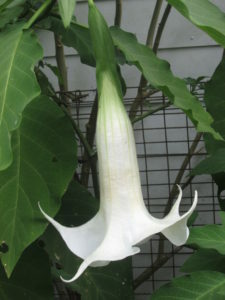 See images for the white trumpet flower in this website …. The beauty of nature !! 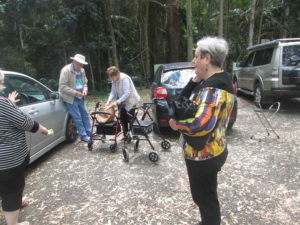 An Australian cliff orchid growing very profusely ….. 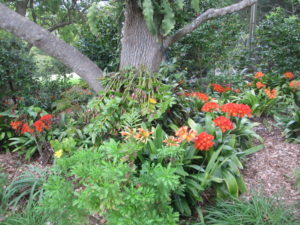 Spectacular bed of cliveas mixed with other plants under a tree ….. they love more shaded areas …. 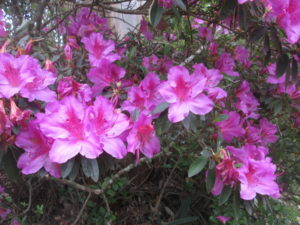 Azaleas with their rich purple colour, are a delight see and enjoy …. 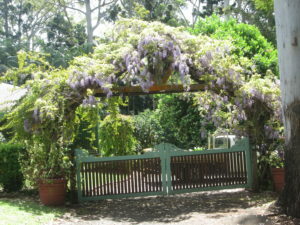 A wisteria vine spreads out over a specially built round trellis …. 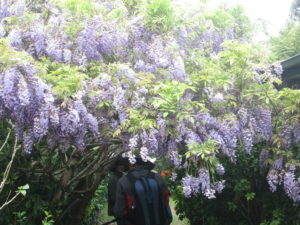 the beautiful purple flowers hang down profusely to form a continuous mass of purple …..
To sit or stand underneath a flowering wisteria vine in full bloom, gazing through the mauve veil of flowers, inhaling the scent, and listening to the bees is bliss. 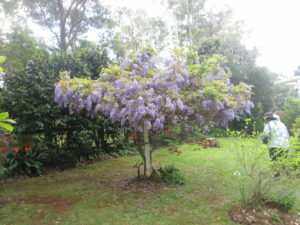 A wisteria in full beautiful bloom escaping up a random tree will stop traffic, but as we mention here you don’t need a garden to grow one. 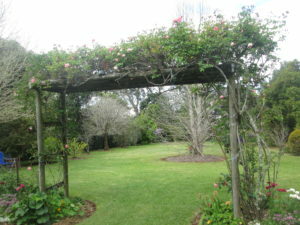 A climbing rose growing profusely over wooden trellis, divides the back garden into two garden rooms …. 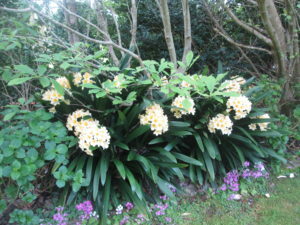 Another spectacular bed of cliveas as in House 2 ….. they love more shaded areas …. 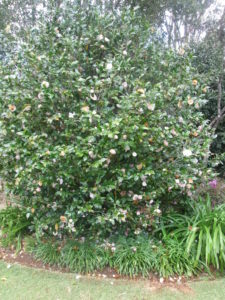 A camellia bush in full flower the week we were there …. White agapanthus and its stiff green straplike vertical leaves, creates an eye catching contrast to the informality of the surrounding garden shrubs and to the the informality of the grey tree trunks behind. White agapanthus are not often seen …. 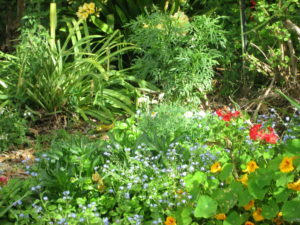 the common one is the blue agapanthus ….. 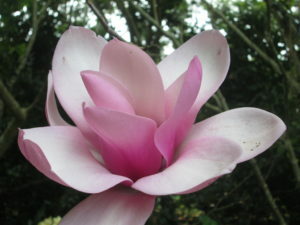 The genus name means flower of love, from the Greek agape, meaning love, and anthos, meaning flower. Agapanthus have long, fleshy leaves that form dense clumps of evergreen or deciduous foliage (choose evergreen forms for all-year action). 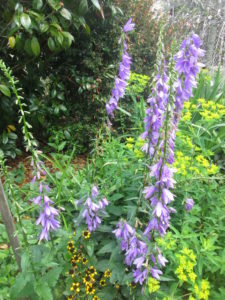 Tall stems tower above, bearing heads of bell-shaped or tubular flowers, in shadess of blue, purple or white. 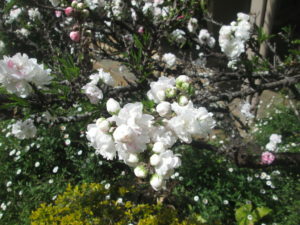 In frost-free climates, flowers of evergreen varieties appear over a long season; in cooler zones, summer is the principal flowering season. Agapanthus ranges in height from 20cm for dwarf forms, while giants can be up to two metres. 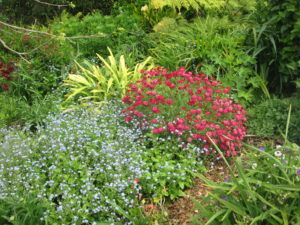 Blue is a cooling colour and in the garden it provides a restful, serene atmosphere. 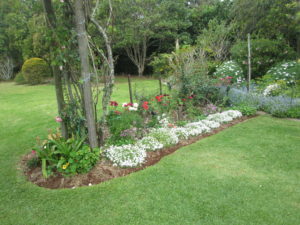 Limiting colours in the garden is an easy way to create a vibrant and fresh look. The combination of blue and green works well with lemon, white, orange and silver. Strangely there are only a handful of blue flowers. Plumbago is a triumph of summer and is best used as a medium-size hedge growing to two metres. The ‘Royal Cape’ variety is a more intense tone of blue and I believe it is a superior plant to the common sky-blue plumbago. 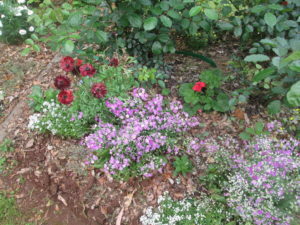 Fan flower (Scaevola) and Lechenaultia are two excellent Australian native blue-coloured groundcovers that grow like mounded carpets and are excellent planted around clumps of agapanthus. 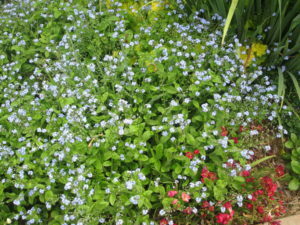 Blue flowers such as these are disease free and easy to care for. 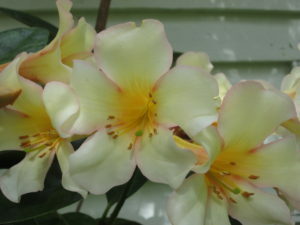 They can be grown with each other and enjoy similar conditions – a hot, sunny position with limited water. It’s a nice welcome home to pull into a driveway bordered by a sea of blue flowers. Blue and white agapanthus make an excellent evergreen border to paths and driveways in areas exposed to the hottest afternoon sun. 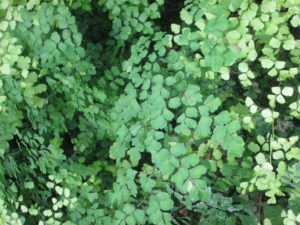 They have neat, lush-green strappy foliage and the leaves gently curve at the ends. 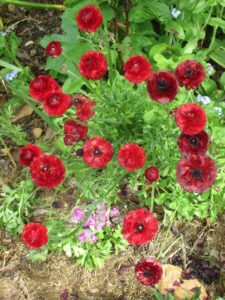 I use the smaller dwarf forms to edge garden beds and use the giant forms as large clumps of colour in my perennial borders. Planted en masse they look like the gentle waves of the ocean and there is nothing more beautiful than an entire row of blue out the front of a white picket fence. Agapanthus can also be easily grown in large pots for the balcony, courtyard or veranda. However, they prefer cramped root conditions and to be potted up gradually rather than swamped by huge amounts of wet soil in a large pot. 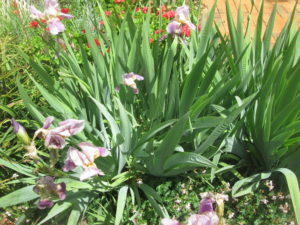 Why stick to the old sky-blue form of the much loved agapanthus when in one trip to your local nursery you can see a number of coloured blooms, from amethyst to ivory, striped and even rosy pink. ‘Queen Mum’ is a new giant variety with white flowers striped with the palest of blue. 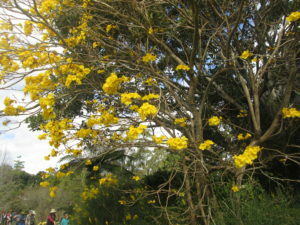 It reaches two metres high and has mid-green leaves that grow to one metre. A flower the Queen Mum herself would have found very eye-catching. ‘Black Panther’ has purple flower buds and dramatic, nearly black flowers with the usual green foil of foliage. 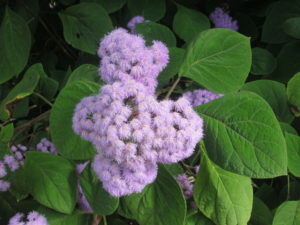 ‘Purple Cloud’ is another giant form, but as the name suggests, it is amethyst purple. 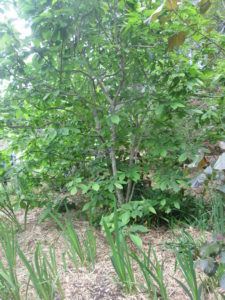 I use it at the back of the garden bed. 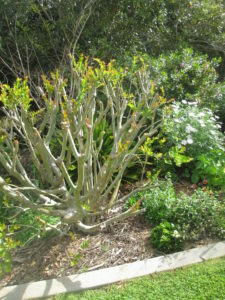 Grey-green foliage grows to one metre high and the flowers reach to two metres and about 30cm in diameter. Truly stunning and well worth the hunt. ‘Alba Roseus’ is the closest agapanthus has got to a pink flower, although the pink tone only appears as the white flowers age. 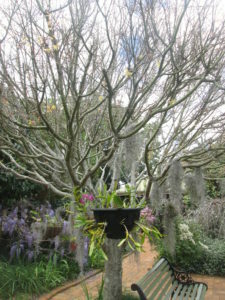 Vertical in effect, with all the individual flowers held upright. 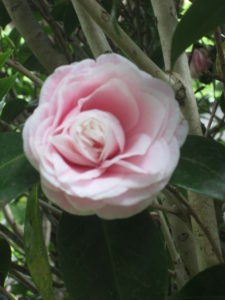 Grows to 70x70cm. Pot-grown plants. 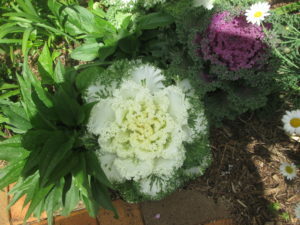 ‘Snowball’ is one of the lowest growing of all with evergreen clumps of short, upright dark-green leaves. 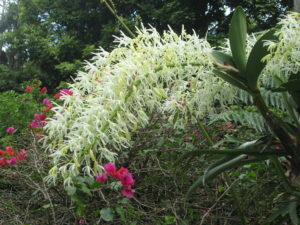 During summer, quite large heads of white flowers are produced. 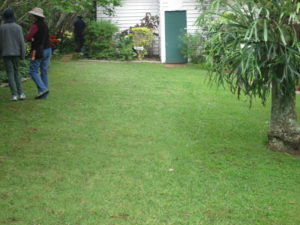 It will make a fine edging plant as it doesn’t spread much. Foliage clumps 20x40cm. 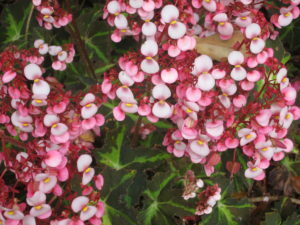 Flower stems are 30cm tall. 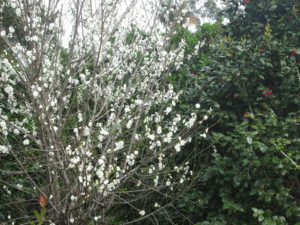 ‘White Orb’ is a large, free-flowering white variety with huge flower heads, some 25cm across, with one-metre tall stems. 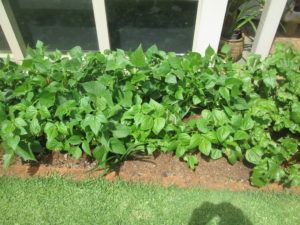 The evergreen foliage mounds will grow to 50x90cm. A sunny spot will suit, although it’s happy in light shade. 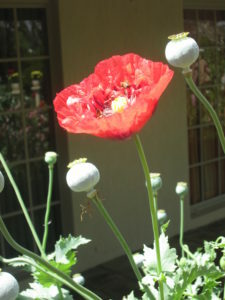 ‘Baby Pete’ is a long-flowering, very drought-tolerant dwarf form with flower stems reaching up to 35cm. 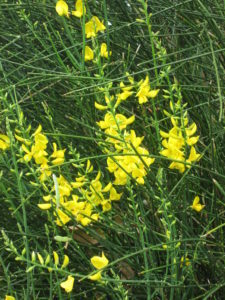 Cultivated from the Australian-bred ‘Peter Pan’ it has been declared sterile, therefore it has a non-invasive habit and is not classified as a weed. 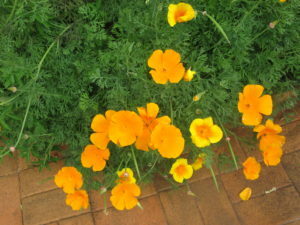 Grows wonderfully in pots, or as a low-growing garden border.